Whether it's 32 cores or 12 cores, it's all priced to kill Intel. AMD formally announced four new 2nd Gen Ryzen Threadrippers (also called “Threadripper 2”) Monday morning, at prices aimed to kill Intel. The 2nd Gen Ryzen Threadripper 2990WX has 32 cores, 64 threads, and a list price of $1,799 (available via NeweggRemove non-product link or Amazon). Yes, we know, this sounds like a lot of money. However, AMD’s new flagship CPU is actually a pretty spectacular bargain compared to Intel’s top dog, the Core i-7980XE, which launched last year with 18 cores and a price of $2,000. Priced out per thread (both CPUs feature “virtual” cores to double the total compute threads) the new 2nd Gen Ryzen Threadripper 2990WX costs about $28 per thread, vs. the Core i9-7980XE’s $55 per thread. 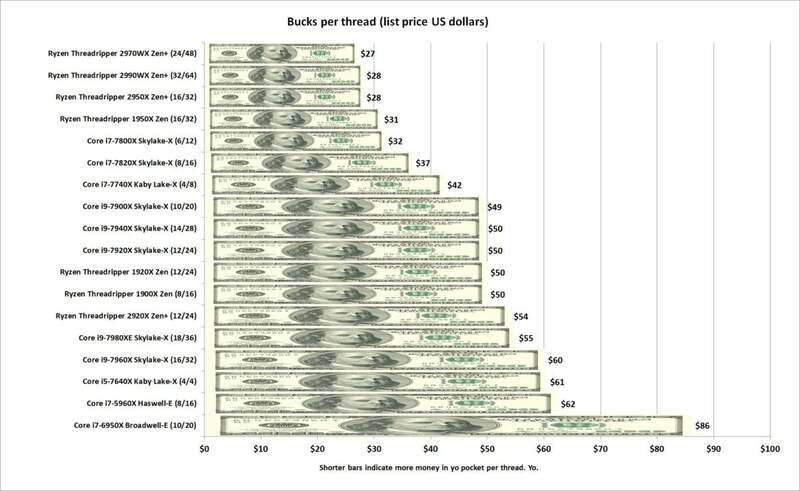 Think of it like Costco: The more threads you buy, the better bargain you get. 2nd Gen Ryzen Threadripper 2920X with 12 cores, 24 threads, and a base clock of 3.5GHz and boost clock of 4.3GHz, for $649. 2nd Gen Ryzen Threadripper 2950X with 16 cores, 32 threads, and a base clock of 3.5GHz and boost clock of 4.4GHz, for $899. 2nd Gen Ryzen Threadripper 2970WX with 24 cores, 48 threads, and a base clock of 3GHz and boost clock of 4.2GHz, for $1,299. 2nd Gen Ryzen Threadripper 2990WX with 32 cores, 64 threads, and a base clock of 3GHz and boost clock of 4.2GHz, for $1,799. The 32-core Threadripper 2990WX is available for pre-order today and expected to be on shelves by August 13. The 16-core Threadripper 2950X will hit shelves on August 31.The last two, the 24-core Threadripper 2970WX and the 12-core Threadripper 2920X, won’t be available until October. All four new 2nd Gen Threadrippers are based on the improved 12nm Zen+ architecture the company rolled out with its 2nd Gen Ryzen chips earlier this year. Officials say all CPUs are drop-in compatible with existing X399 motherboards, which also all support BIOS updates without the need for an older CPU. The new CPUs offers a decent performance uptick over the first-generation CPUs, AMD says, and against the comparable Intel parts, it’s not much of a contest. The company said the 32-core Threadripper 2990X is about 51 percent faster than the 18-core Core i9-7980XE in Cinebench R15. Other multi-threaded tests such as POV-Ray place the 32-core about 47 percent ahead. Outside of multi-threaded apps, though, expect performance to favor CPUs that run at higher clock speeds. In fact, that’s why AMD is adding the 'W' to some of the 2nd Gen Threadripper CPUs. AMD said it knows a lot of applications and games favor higher clocks over thread and core counts. The two new 'X'-branded CPUs, or even its 8-core Ryzen CPUs, address those users, the company said. It’s branding the 24-core and 32-core Threadrippers with ‘WX’ to help people understand these CPUs are aimed squarely at “creators and innovators.” In other words, chips with a 'W' are for people who push pixels, frames, and rays around for a living, and need every core and thread they can get. The introduction of a “consumer” 32-core CPU marks a major milestone in the CPU wars. A little over two years ago, Intel introduced its 10-core Core i7-6950X at and astounding $1,723. And now, we’ll soon see a 32-core CPU for $1,799. 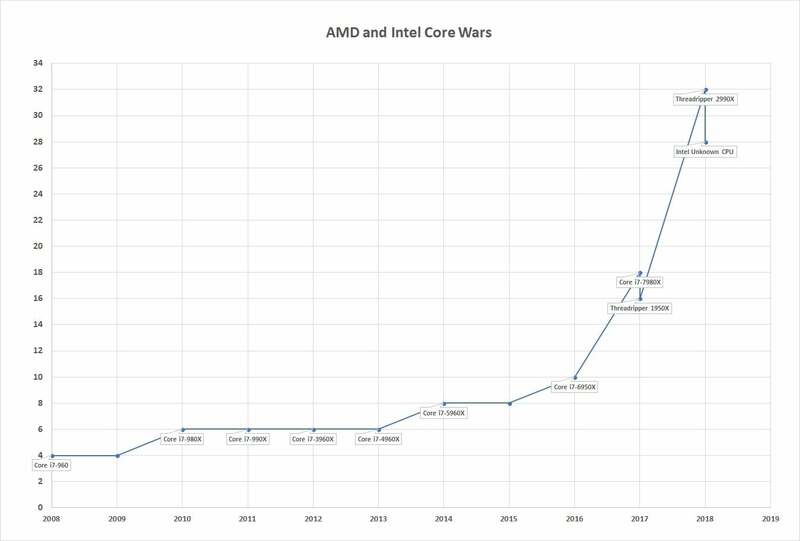 The core wars are here. Intel isn’t sitting around sipping lemonade, but it’s in a tough spot today. The day before AMD unveiled the 32-core beast at Computex, Intel showed the world a 28-core CPU running at 5GHz and said to expect it as soon as the end of this year. The problem for Intel is that CPU demo wasn’t exactly up-front. Officials said the CPU was running at 5GHz, but they didn’t disclose that it used an industrial water chiller to achieve the feat. Intel later said the demo was always intended to be billed as an overclocking demo, but in the frenzy (a five-minute part of a nearly hourlong presentation), the company neglected this detail. Regardless of the dust-up, the AMD Threadripper 2990WX (preorder on NeweggRemove non-product link or Amazon) still has several months' head start while Intel can only field an 18-core CPU. Even worse: It’s difficult to see how Intel can sell consumers a 28-core that is priced to compete with AMD’s Threadrippers without angering its business users, who are currently paying $8,719 for the existing 28-core Xeon Platinum 8176. AMD’s strategy is yet again to play a disruption game with Intel, because it doesn’t have to worry about any workstation customers today. In a way, AMD is daring Intel to match it on core and pricing—a skirmish Intel has been careful to avoid so far.